I have kids so I’m stressed out all summer long. I work from home so while I truly enjoy what I’m doing and I don’t actually dream of doing anything else, the kid thing stresses me out enough. Plus other family obligations, cooking, cleaning, yadda, yadda, yadda. It’s a lot to handle sometimes without the confines of a school schedule to keep things running smoothly. Instead of waiting for school to start and getting back in a routine, I’d rather take hold of the stress now and enjoy the rest of my summer. Maybe you’re in a similar situation. 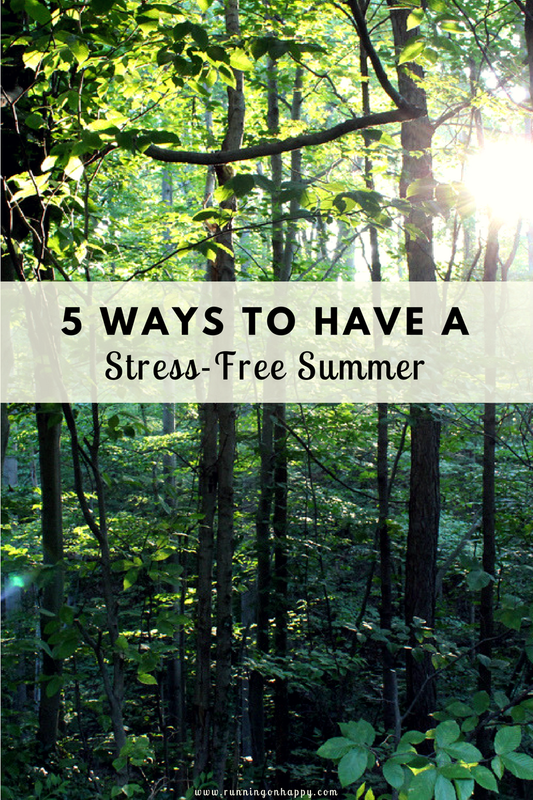 So to help us both out, today I’m giving you five glorious ways to have a stress-free summer — or as stress-free as possible, anyway. 1. Take a forest bath. The benefits of forest bathing include increased immune system, lower blood pressure, better mood, and better ability to focus. There’s a lot of information out there about forest bathing, but check out this article and this one, too. Don’t live near a forest? Come visit Cleveland. I’ll show you all the cool places to take a forest bath. Running is the obvious choice, no? 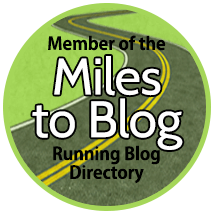 After all, this is a running blog. But aside from being obvious, there are mountains upon mountains of evidence pointing toward running as a stress-reliever and general health-booster. Next time you’re stressed, lace up and head out for a nice and easy shakeout run. 3. Try a new dish or beverage. Finding something “new” during the summer can be fun and exhilarating — especially when it comes to food and beverage. There are tons of amazing seasonal dishes to be enjoyed with the bounty of summer. Plus, kicking back at a local eatery with your significant other or bestie is a great way to have a stress-free summer! Kayaking, hiking, putt-putt golf, creek walking. Do something fun. Get outside. Get dirty! It’s summertime, after all. Reconnecting with friends is by far one of the easiest, most fun, and best ways to relieve stress. Whether it’s on the trails for a run, at the local wine bar for a night out, or poker night with some buddies, human interaction is the pinnacle of stress relief. We are a social species, after all. Call up your friends and hit the town! Keep things light and fun this summer. If kids or work start stressing you out, you know where to get some ideas to help you burn off some steam. If you’re an avid Friday Five linker, the topic for the rest of July is FREE. The ladies of Fairytales and Fitness and I are busy coming up with lots of ideas for the upcoming months. Have a topic in mind for the Friday Five 2.0? Comment below and we’ll add it in the rotation (and give you credit linked back to your blog!). What’s one thing you do to relieve stress? What’s your favorite summertime beverage? I feel like stress is my middle name lately. People think that working for a school system that the summer would be quieter, but its my busiest time of year! I do have a vacation planned in August so Im glad I’ll be taking that time to slow down and recharge. How are you busy in the summer?! Lol! Thankfully, summer is our low stress time. The kids sleep in, so I usually get my runs and work done before they wake up. Then I can do whatever they want. But when they were younger it was much harder. I’m trying to enjoy this time where summers are calm as I’m not sure it will be the case in a few years as my older son approaches college. I think just having a moment to yourself is a great way to de-stress. Since I don’t have kids I can only imagine how summer is. Good luck! I feel like I’m always stressed about something, lol. Although I don’t have any vacation plans this summer, I’m going to try to see my friends more often. I feel like I’m in a cycle of work, workout/run, eat, sleep repeat so I’m hoping to change that up a bit this month. For Friday Five themes, what about favorite races, fall activities, running fuel, post-race meals/snacks? Summer is lower stress here because we have very few plans. But when I need a break it’s harder to come by. Great ideas. I love spending time in the woods in the summer – it’s so much cooler it’s amazing! I don’t know why but this summer feels so stressful for me. I think because I have to pack so much into my one day off during the week. This year I seem to have appointments every Thursday. Ah, the joys of having a chronic illness!!! Whomp whomp. But I know how you feel because when I have kid-free time I have to cram everything in within an hour here and there. I am a teacher, so I have 10 weeks off in the summer. Normally I have zero stress during the summer due to that fact, however, this summer I am starting to feel overwhelmed! I am wondering if my feeling of being overwhelmed is no longer situational (like when work gets crazy) or if there is something wrong with me because why should I feel overwhelmed in the summer!? I’m a teacher, with no kids of my own, so the stress happens during the school year, lol. But Summers are hard with all the parties, weddings, and trying to fit in all the to do’s. I love doing something fun outdoors. Last week my husband and I went on a long hike for a few hours, and we only used our phones to take pictures, it felt great to disconnect 🙂 Happy Weekend. That’s the way to do it! Hiking is such an amazing and stress reducing activity. Cheers to stress free summers! I can remember the days when my kids were young! I agree try something new! A new drink, food, activities- be bold! I can see where trying to entertain the kids while trying to relax yourself could be stressful! The forest bath sounds fun! I try really hard to keep them as unplugged as possible and use their imaginations. They do a really great job and have fun. But when I need a break, sometimes the tv is necessary. It’s relaxing for everyone for a half hour. I have quarterly reporting starting next week, along with wrapping up year-end deadlines. I didn’t think I was stressed, but I’ve started breaking out a little bit. A sure sign, for me, that I’m more stressed than I thought. It’s a good thing I’ve started running after my break because I will need those runs to calm down. Sounds like you’ll be busy for a while! Running will help for sure. Releasing stress is SO important in the summer…just being able to feel the warm weather helps me, but I’ve realized that I still do rely on running as a stress reliever! I’m hopnig to go visit the local arboretum and just enjoy the scenery! Warm weather helps me, too. Just sitting outside is amazing! One of my favorite things of summer, is not having to worry about homework! that for me takes 50% of the weeknight stress! everything else I still have to deal with, packing lunch, getting up early, because my son goes to daycamp, but the no homework days are the days we live for!! Great tips! reconnecting with nature and friends always helps me de-stress. And things definitely get better when I say no to things I don’t really want to do or don’t have the capacity to do. I totally agree!!! It’s like a weight is lifted when we finally say no. I love being outdoors as much as possible, even when it’s hot and humid. I live for summer! I have a week where I have NOTHING scheduled. This way we can do whatever we want and not stress about making something schedule-wise. Brilliant plan! I love having nothing to do sometimes. Great ideas! A sunset kayaking excursion WITH a glass of wine ….that’s relaxing!! And yes, I do love to head down to the hubby’s family farm, put on my rubber boots and take a walk down the creek …there’s nothing better! I see what you did there — I would love to go sunset kayaking with wine! And creek walking is a sure winner here, too! Same here, and I’m certain that’s why we get along! Hope you get to enjoy the summer sun soon. Love all your tips. For me, when I really need a break I usually go for a run but also I take a day off work to myself. However it’s spent cleaning the house, baking for the family, and getting caught up so my time is with my girls when they get home. When I really need a break I try to leave and go see friends. It usually helps! Going for a run is always a great way to destress. I cannot remember my life without running! Me neither, girl. Me neither. We definitely don’t have any forests here, but all the rest of it applies. We are actually having a great summer with pretty little stress. Ive made it a point to just wing it and have lots of fun this year, and it seems my plan is working. That’s great! We’ve had a pretty stress-free summer — except when my kids bicker. Great tips Rachel! Trail running def makes me happier!